Yakira Mirabito speaks to a group of peers at a Quest Scholars Network town hall Thursday. Mirabito said students can generate resources if they voice their concerns regarding financial barriers. As co-president of the Quest Scholars Network, Yakira Mirabito says her access to University officials can generate concrete resources if students voice concerns. Mirabito began the discussion at the Black House — which was open to all low-income and first-generation students, as well as their allies — by listing programs created after students shared the financial barriers they’ve encountered as low-income students, including the Student Activity Scholarship and Student Emergency and Essential Needs Funds. 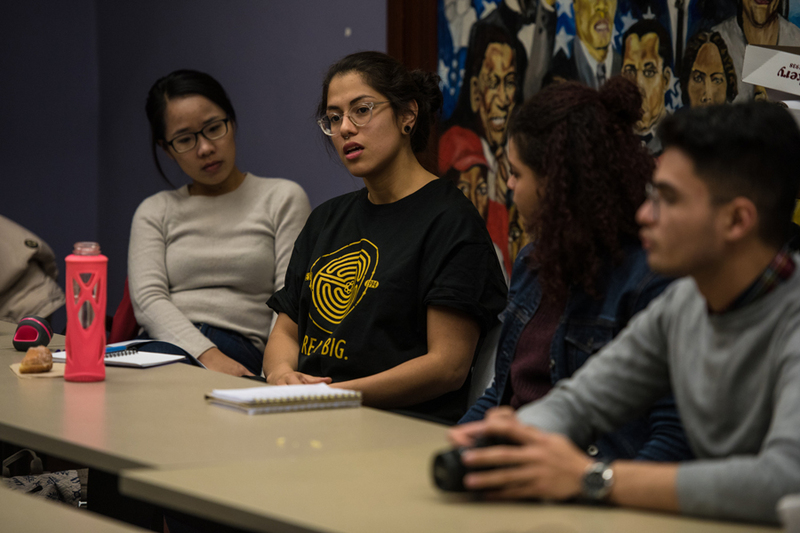 About 15 students discussed those obstacles and potential strategies to get the broader Northwestern community involved. To overcome these barriers, students suggested they ask professors for assistance, appeal financial aid decisions and attend an upcoming Community Dialogue to advocate for their interests. Among students’ concerns was the administration’s perceived lack of public support for initiatives to aid low-income students. Madisen Hursey, vice president of Quest, said University officials should communicate their support with comparable publicity to their stance against sexual violence. Hursey also said it’s important students know who in the administration is taking concrete action, noting students’ lack of awareness regarding Provost Jonathan Holloway’s approval of a textbook assistance program last fall. Hursey criticized University President Morton Schapiro’s previous comments that it “doesn’t matter who gets the credit” as long as something “right” is done. Even so, some students criticized Northwestern’s diversity and inclusion initiatives, saying the University focuses more on advertising its diverse students than actually fostering inclusion and support for them. Reyes, a Quest Scholar, told The Daily the conversation about low-income students often ends with the University’s goal of 20 percent Pell Grant-eligible students by 2020. “All (University officials) are doing is promoting an image for Northwestern so that they can look good for the rest of the world,” he said.